Knock some cents into your style with this richly constructed penny necklace. "See a penny, pick it up. All day long you'll have good luck. Give that penny to a friend, and your luck will never end." 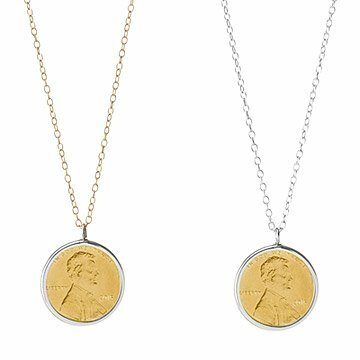 Knock cents into style with this richly constructed necklace that suspends honest Abe from a gold plated or sterling silver chain, featuring the year of your choice. Pinch a penny from any year to instantly add a piece of Americana, and a bit of luck, to your neckline. You choose your year! Handmade by Beatrice Matiash in New Jersey. Chain: 18" L; Pendant: .75" dia. Pretty and unique necklace! I love it! Was disappointed in the price-thought it would be better quality, but it looks like something you get out of a candy machine. Remember that year? It was great! This was a memorial gift i got for my mom , my grandma pasted away and i had the penny stamped with her birth year cause she was the number 1 grandma and best friend. Since she has past every time me or my mom have a fork in the road or a bad day some how a penny will show up in places that there was no penny before. Or in the middle of a ' i dont know what to do' thought a penny will catch our eyes either on the ground , the counter . So this was a very meaningful gift for my mother now when ever she has doubts or a bad day she has her penny to guide her the way! I purchased this necklace for myself, with the year 2014, As a symbol of how much I finally accomplished this year! I am proud of myself!! I gave this beautiful necklace to my wonderful boss (who is the owner of the company). The date on the Penny was the year she started her company. I told her that for some a penny was a sign of hope and I wanted her to know that the year she formed her company, she gave thousands of people (associates) and all the patients we serve, hope. I told her that let this penny be a symbol of all the hope, love, and joy she brings to others and may God continue to bless her greatly for it! She is not an emotional woman, but she became teary eyed, and said that was one of the most thoughtful gifts anyone has ever given her. She LOVED it and was extremely grateful for the gift. The penny is so polished that it's almost impossible to read the year. The year was the most important part of this gift. It's a nice piece otherwise. The penny itself was great. The chain could have been nicer. The clasp is odd and took awhile to figure out. Really don't care for the clasp.